As part of October's ongoing month of firsts, my friend Cindy Cogbill suggested that I collect people's first memories of Memphis. I asked and more than 250 of you answered. Here are the collected responses to the question "What's your first Memory of Memphis?". "Libertyland! I moved to Memphis in middle school so the first thing we did in the city was go to Libertyland. It was fun at the time." – Mary T.
"Walking into Alex's, 18 years old, not getting carded." – Dan H.
"Seeing the skyline coming across the bridge…then Superman Dam Fool. I was sad to see it gone." – Vanessa W.
"Going to Chucalissa Indian Village with my 1st grade class at Cromwell Elementary. It was maybe 1984." – Jaimie N.
"Going to Mud Island on a field trip in 1985 and walking the Riverwalk even though our teacher told us not to." – Kevin M.
"I moved here on my 25th birthday six years ago. Within 10 minuets of meeting my roommates and unloading my stuff they took me to the lamplighter and I met Miss Shirley, I literally noticed her glow and aura and spent hours and hours asking her questions and listening to her stories each week. We would trade soups once a week too. Upon meeting her I was certain I was in my chosen place, and have never doubted it since. I miss that woman dearly." – Clayton H.
"When I was little, my parents would drive up to Memphis and take me and my sister to the zoo. I remember my favorite part was chasing/terrorizing the peacocks." – Kim S.
"My parents would always take us to the airport to watch the planes takeoff and land." – Cindy R.
"Riding in the back seat of my grandmother's Buick (circa 1982) to go Christmas shopping at the "new mall up in Memphis." I'd never been near a commercial airport before and I got scared because I thought the giant planes were going to land on top of the car!" – Justin M.
"My uncle drove me down Beale street at night back in 1973. Nothings was open, there were no lights, and Handy Park was just a grassy lot. Interestingly though there was a group of four or five people standing around a shopping cart in the dark and someone was playing a trumpet." – Jon D.
"In 1988 my company, a retail chain who I'd been a manager for, moved me here to open up a store location at the Mall of Memphis, help open one at the Raleigh Springs Mall, and then open up (and then stay on at to run) a location at the just-being built Oak Court Mall. My first memory of Memphis was that the people there were VERY nice to me, when I was admittedly scared and nervous and had no idea what I was doing. They gave me good service at the hotel, good directions to the mall and to places nearby that I would want to know about, and advice on how to rent an apartment." – Dave L.
"Came from Obion County for a field trip in 2nd grade (1986) to visit the zoo and see the circus. Got to out out in the middle of the arena and hold long sticks for the clowns with spinning plates. The day ended with a trip to ShowBiz Pizza!" – Will H.
"Flying in from Las Vegas at midnight in the winter for a 2-hr layover before heading to Miami. I remember it well because it was so cold and the airport was so empty, but it somehow made me want to visit the city someday." – Paulo M.
"Coming to a biomed engineering conference and staying in a converted patient room in the basement of old Baptist Hospital." – Julie B. "I was driving into town, 10 hours from my hometown, to do a summer internship. I was driving through a very sketchy part of town and was terrified to think that I was moving to this city on my own for the next three months. Once I finally drew near the city I was relieved. My GPS had just decided to take me through probably the most unscenic route. But once I found "home" at Christian Brothers University I was happy. I had an amazing Summer in Memphis, on the streets of Beale, the third floor of Club 152, watching the Memphis Redbirds, and stuffing my face with delicious barbecue from all over the city. It was an unforgettable experience and I can't wait to visit again." – Candace W.
"Visting Rhodes on a Prospective Student weekend and driving down Sam Cooper at night to attend an MUS football game with my hosts. Still the remember the lights and feel of that night twenty years ago." – Christy M.
"The Peabody ducks and Neelys BBQ on Valentine's Day 2010. My husband and I were in town so he could interview at St. Jude. I was pregnant. Now we have lived here a little over two years with our 2 year old and 6 month old." – Jennifer P.
"I was on a class trip here in the third grade. I fell in love! The sounds, the grit, the art… even at a young age I knew this was going to be my home. Thank God it is!" – Elizabeth R.
"Meeting Elvis twice ( once he was riding a black horse in front of his house; second he and another guy riding 3 wheel bikes (there were real pretty girls on each bike)." – Camille H.
"Visiting Elvis Presley's house and seeing the jungle room, then partying on Beale Street." – Lucy I. "Riding down Madison Ave thinking to myself how I would like to live here. That was in 1996." – Jason V.
"My dad was born on Beale street and I still have relatives in the area. Going to Graceland when Elvis was still alive. We pulled in to the driveway and my dad ended up talking to his uncle I think. He even gave us his newspaper which I still have." – Ricky G.
"Standing at the gates of Graceland and staring at them and thinking: I'm here." – Claire F.
"In 1980, it was so hot you could have fried an egg on the pavement. I cried when I first walked up the drive seeing Graceland for the first time." – Janice M.
"Came to Memphis for GM training at Hampton HQ. Went straight to Graceland before I even checked into the hotel. Then hotel, then the legendary local musicians on Beale St. That was Fall, 2008. I've been back at Graceland 19 times since then." – Virgil R.
"Watching Penny Hardaway and the Tigers at the Pyramid. While the seats at the pyramid sucked compared to the Forum, it was something special to watch." – Tyler C.
"Jerry Lawyer pile driving Andy Kaufman in the Coliseum and hearing about it on FM 100 the next day going to school." – John R.
"Seeing Hulk Hogan vs. Randy Savage at the Coliseum probably around 1987." – Jason V.
"Blooper (the mascot) at Memphis Chicks games and he Medicine Man (mascot) at Tiger games at the Coliseum." – Kim G.
"Seeing the Memphis Pharaohs play at Liberty Bowl Stadium, and wondering why we got out of school in September for a fair." 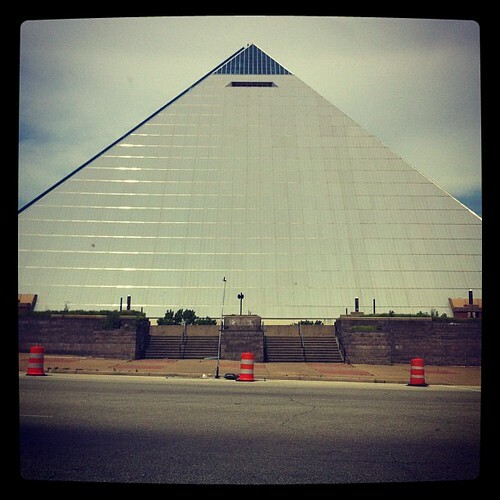 – Nathan S.
"The Big Dig, when they broke ground fro the Memphis Pyramid." – Ryan R.
"I was in elementary school. I remember the "Big Dig". A helicopter droped a large, lit shovel to break ground for the Pryamid." – Adam G.
"The first time I came to MEM (other than tagging along with parents) was coming to a James Gang concert in 1971 at the Shell." – Deb J. "Singing "Born in a Memphis Tennessee" instead of "born in the USA" to my family members as a toddler." – Jonathan M.
"Driving over the Mississippi River into town with my parents listening to Paul Simon's "Graceland" — about to start my freshman year at Rhodes. Great memory! I also listened to Graceland driving over the Mississippi 4 years ago as we were moving back after living elsewhere for 12 years." – Katherine B. "Seeing Elvis Costello at the Mud Island Amphitheater in1982. 'Memphis, we finally meet!' was his greeting when he hit the stage." – Andrew J. "The first time I came to Memphis was for Gonerfest 3. I proposed to my wife that weekend since neither of us had been to Memphis before, and lucky for me she said yes. We've been back a bunch of times since then and always had a ton of fun." – Joshua N.
"Getting trapped in a tornado at Memphis in May Barbecue Fest in 2003. We stayed in the park and were super scared, but when the storm passed we had free reign of the whole place. It was a great 1st weekend in town." – Brent L.
"Lipsey's Seafood at Union and McLean, where the Starbucks is now, circa 1980. I was two. Live Lobsters!" – Audra W.
"I moved here from Texas in 2007. My friend met me at my house to help unload truck and then drove me to Jerry's snocone -now I take everyone." – Richard E.
"Smelling BBQ in the airport as soon as I stepped out of the gate." – Courtney R.
"Sitting at TGI Fridays opposite the baseball stadium listening to the cheering fans and eating chicken marinated in Jack Daniel's. I've never eaten anything as fantastic from that day to this." – Valerie F.
"Being from Arkansas, it's getting all gussied up as a little one – coat, tie the whole bit – to come to downtown Memphis to go shopping at Gerber's, Goldsmith's, Levy's, Lowenstein's and Julius Lewis with my father." – Jim F.
"Riding my Big Wheel down the sidewalk on Gurnsey near National. It was fall, leaves were gold, Dad was walking along beside." – Jeremy K.
"I was 4 years old when I moved with family from Houston and I LOVED all the trees. Climbing southern magnolias in the yard, at Chickasaw Gardens Lake, the edges of Overton Park greenspace was the best." – Josephine F.
"Going downtown to my father's office on 18th floor of the First National Building (now First Tennessee). While my dad worked, my brother and I would make copies of our hands on the copy machine and drink free cold coke from the vending machine." – Michelle F.
"My earliest memory is from when I was almost 3. My mom, grandmother, aunt, & I got dressed up and rode the bus downtown to go to lunch and the Enchanted Forest in the downtown Goldsmith's." – Mary B. "My first real memory is going to see Santa on the little concrete strip down Chelsea Ave and Hollywood." – Judy J. "Going to the zoo with my grandmother. She always got our pics made in front of the sign that told the date. I think in the first pic I might have been about 3 years old, so some time in 1956." – RaeAnne C.
"Living in Spokane WA watching PM Magazine in the early 80's about the reopening of the Peabody Hotel and watching the ducks. I moved here in 1984." – Terese K.
"I moved here in 1990 from a suburb of Chicago and I learned quickly that the south does things very differently from the north. That being said, I was suspended a week into 6th grade for not saying yes mam. I It should also be mentioned that I was launching grapes at the ceiling off of my fork in the cafeteria." – Jeff H.
"Soon after moving to Memphis in 1973, my father and I went piano shopping on Union. While I was playing on a few pianos, in walks in a barefoot man with a loincloth and a bearclaw necklace. Later, my father would explain all about that curious creature Prince Mongo. That was a Memphis wake up call." – Thomas J. My first BIG memory of Memphis was in the 60's and it was called "Safety Town" (I think). It was by the mall in Whitehaven and we were taught safe in riding our bycicles. We even got a little "STOP SIGN key chain" that I still have somewhere!!! My favorite thing is visiting the local businesses that have existed for many many decades and helped grow and shape Memphis into what it is today. My absolute favorite is a small family furniture and hardware store on Hollywood called Hollywood Furniture and Hardware. The same family owns and operates it that opened it in the 1920s. And they are still in the original building in fact the owner said their parking lot is the old trolley line. The family loves sharing the history of the area and their store. They have incredible furniture too cheaper than I have seen anywhere in town. I would reccommended people to stop in an enjoy this historic little gem if for no other reason than to take a step back in time. When I was little, my cousin and I would spend a week with our Grandma here in Memphis every summer. One of our favorite things was going to Chucalissa and talking with the Native Americans that ran the place. I think we may even have written them letters at one point. They were always so sweet to us silly kids. I have several Very First Memories of Memphis but because they're all enmeshed having happened around the same time (1971) when I was 3, I don't actually know which was the Very First. But the one that really is coming to the fore this AM is my dad taking me to Fairview Drive In on East Parkway near Young. Certainly he may have taken me before I can recall it and he definitely kept taking me after, but I remember being 3 and going there, probably after a Tiger game at the Coliseum. The huge concrete polar bears holding snowballs flanked the walk-up order window and Fairview didn't even have to be delcious because those bears simply were magic. 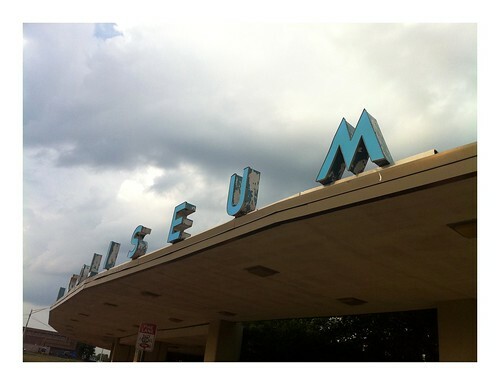 They still are in my Top 10 of Favorite Things of Memphis, wherever they are. Anyway, the shakes and ice cream treats were incredible too. RIP Fairview Drive-In!